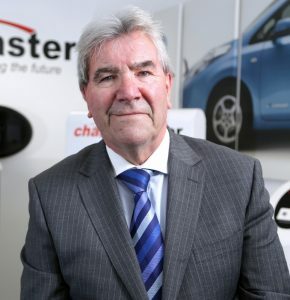 Chargemaster CEO, David Martell, on the growth of public charging and why EVs will become much more usable over the coming years. How is your POLAR charging network progressing? We’ve got about 4,000 charging points and every month that’s growing at somewhere between 20 and 50 units. There are two very distinct strategies; destinations like hotels, sports facilities and supermarkets, and rapid chargers which are more for extending the range and strategic use. We’re putting about 12 of those in the centre of London and then others on the arterial routes to the motorways. Then we’ll be putting them on strategic junctions on trunk roads and so on. How much data can you gather about the way the network is being used? Obviously we have to be discreet in terms of confidentiality but we did some work for OLEV on the usage of public charging, and it was well over the double the previous year. There’s a lot of Outlanders around, so the figures are distorted, but 62% of the usage is PHEV not pure electric. If you’ve got a LEAF, or a ZOE, you tend to have charging at home and, unless you’re on a long journey, often that will do you. A year ago [the PHEV share] was less than 40%. You’re getting now PHEVs from Mercedes, BMW and so on, so I reckon that will be 60-70% of the market. Do you get similar information from your home charging points? We have a data team of three people, we have to report back to OLEV the data but we also do our own analysis and there’s very interesting stuff. Interestingly what’s happened is on those is the amount of usage the average charging amount went from a year ago it was about 10kWh now it’s about 13-14kWh. So people are I don’t know whether they’re using cars more or batteries are increasing – there could be a Tesla element in there. People are putting more juice into them, and they’re charging most nights. Has reduced funding affected the market for domestic charging points? OLEV reducing the grant by £200 has made some people with PHEVs wonder whether they need a wallbox, but if you don’t have a wallbox the charging is very slow. So it has been affected by grant funding, but it’s probably a temporary thing. Is demand growing for workplace charging? How much could grand funding affect this? What we are seeing is quite a big uptake in charging points being installed due to planning requirements. That’s partly being led by London and other parts of the country which require 20% of parking spaces to have EV charging points. We see that being more in the offices in London, but if you build an office increasingly in parts of the country you will be required to put charging points in your car park. I think psychologically even If the grant wasn’t too much, it would be a huge impetus for companies to put workplace charging in. I like to think there’s a culture that every company has a couple of charging bays. In California, people like Google and Apple have got banks of literally 100 parking bays because so many people have got EVs. I’m sure a similar situation will come to the UK. What role for wireless charging? On the OEM side of the business, you’ll start to see cars coming out with wireless charging in 2018 model year. It’s obvious. Most new technologies only become mainstream when they’re at least as easy to use as their predecessor. It’s great to have an EV but the only thing is you’ve got to get out and plug it in. If you take that away so you get in and park and it charges, that’s a huge benefit. All of our public charging points are wireless ready, all we need is cars to come along. How else will you make it easier? We’re working a lot on how you charge if you haven’t got off-street parking. We have a demonstration unit of a charging point on a lamp post. Often it’s got enough power going to it to provide a 7kW charge – it usually needs modification, but it saves road closures and putting a new structure up. We’ve also got a master and slave system. If you want to put points on residents’ bays you don’t want to put an intelligent expensive unit in each bay. We have low cost bollards with a Type 2 socket, then there’s ducting under the kerb which, every 10-12 bollards, has a unit which controls all of them. That’s five times cheaper than individual intelligent charging units. Wind the clock forward and people will need to be thinking about charging for whole streets. I remember doing a presentation to competitors a few years ago and they asked how quickly battery capacity will increase. The general consensus is 2-3% per year, but what’s suddenly happened in the last six months is that’s sped up considerably. Nissan LEAF has a bigger battery, BMW has confirmed a bigger battery for the i3, GM is bringing out the Bolt, and obviously there’s the Tesla Model 3. For that size of car a 200 mile range is fine – if you’ve got a 200-mile range and you can rapid charge you can go anywhere. Porsche and other German manufacturers are talking about charging at up to 150kW and 200kW. That’s where it gets really serious. CCS protocol allow for 200kW, they’re all at 50kW now. We will be launching a 150kW charging unit within the next two years. You will still need the 50kW charging units, but it will be slower [to charge]. If you’ve got a 200-mile range with rapid charging a sales guy can use it all the time. I think that will make a huge difference. The next two or three years will be very interesting and, from a fleet perspective, [EVs] will become much more usable.